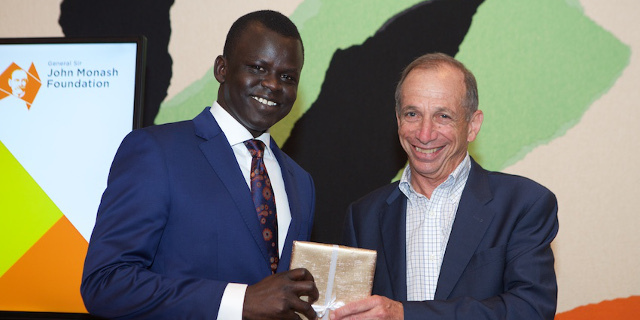 The Melbourne Medical School is delighted to congratulate alumnus, Dr Garang Dut (MD 2014) on receiving the prestigious Roth/Segal John Monash Harvard Scholarship to support his postgraduate studies at Harvard University in 2017. The John Monash Scholarships are one of the most important postgraduate scholarships available in Australia. Awarded to outstanding Australians who demonstrate leadership potential, they support up to three years of postgraduate studies at prestigious universities around the world. Dr Dut will commence a Master of Public Health at Harvard University in 2017. Dr Dut was born in South Sudan and grew up in a Kenyan refugee camp; he moved to Australia when he was 17. He has a Bachelor of Biomedical Science from Monash University and an MD from the University of Melbourne. Head of the Melbourne Medical School, Professor Geoff McColl commented that while at the University of Melbourne Dr Dut was an ‘outstanding student’. In 2007 Garang Dut was a Kwong Lee Dow Scholar (an academic enrichment program at the University of Melbourne designed to support high-achieving Victorian Year 11 & 12 students). During his medical degree he received both a residential scholarship—the VMIAL-PSA Medical and Dental Scholarship—and the John Manson Scholarship with which he travelled to India to gain first-hand experience of global health challenges. Dr Dut is currently a surgical resident at The Alfred Hospital and a Fellow of the Williamson Community Leadership Program. He volunteers in public health education, and has been an Australia Day Ambassador for the last four years. The Master of Public Health program will equip Dr Dut to develop surgical care systems and improve access to quality surgical care in resource-poor settings in Australia.